Alwar at his book shop. The Alwar book shop at present. 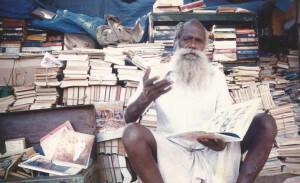 For several decades Alwar Book Shop located on the pavement next to Mylapore Club on Luz Church road has been synonymous with old and rare, and the more common place school and college, books. Readers from not only across Chennai but also from other parts of the country came visiting it. One of them was M.S. Gill, the former CEC who purchased books worth over Rs 1,000 during one of his official visits to Chennai. Avid readers, well known writers, popular stars of the tinsel world, politicians and professionals were regular customers of Alwar Book shop. The famous names who were patrons included Arignar Anna, Alladi Krishnaswamy Iyer, C.P. Ramaswamy Iyer and Ramnath Goenka among others. Thousands of students who could not afford to buy new text books made a beeline to Alwar’s book shop to buy what they wanted. I think, there would not be any serious reader in Chennai who has not visited Alwar Book shop some time or the other in his/her lifetime. Who is this Alwar? Is he still alive? Is the shop still functioning? My search for the answers led me to Alwar’s second daughter Ammu’s home in Nacchhiyappa Street in Mylapore where I found that 94 year-old Alwar is still alive but not kicking. Both his vision and hearing are impaired. I could only communicate with him through Ammu. The shop still exists in the same location where it has been for the last 60 years, albeit smaller in size and better organised with books arranged on shelves donated by a well-wisher. 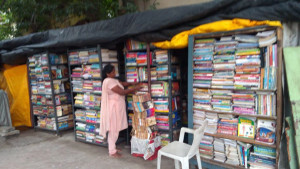 While at the peak of its popularity it had over a one lakh books, today it has only about 20,000. In the last six decades the shop has suffered closure many times because of its encounter with the law-enforcing agencies or nature in the form of rains and storms. Every time, Alwar would be devastated but bounce back with steely resolve to serve his loyal customers. This was possible with the help of sympathetic Mylaporeans and other well-wishers. Alwar’s story is one of passion, perseverance and sheer grit. Born in Vilupuram, he came to Madras in the late 1940s as a teenager with dreams of making it big in the film world. Unfortunately he only got to perform as an extra. He had to do odd jobs to earn a living. Fate had its own plans for his future. When his uncle with whom he was staying passed away, the responsibility of running the small bookshop, fell on young Alwar’s shoulders. He took to the business like the proverbial duck to the water. He was educated enough to read the titles to help him group them subject wise. The first shop which he started in 1952 was located outside the Suguna Vilasa Sabha and he later shifted opposite the old Kamadhenu theatre. He never moved from there. Alwar remembers that the first set of books he received was from the owner of Amrutanjan Pain Balm factory, located close to his shop. This was followed by donations from other well-wishers. He also went around door to door to collect discarded text and other books from homes across the city and from wastepaper merchants for a price. He ran the shop singlehandedly for several years, until Ramanan, known to all the customers as Iyer, joined him. A Tam-brahm, the latter used to run an old-books shop in Moore Market which he lost in the fire that destroyed the whole heritage structure. Ramanan, who was paid a regular salary by Alwar assisted him in his business for over 30 years until he passed away in 2013 due to cancer. Alwar lived on the pavement adjacent to the shop and would not sleep the whole night guarding his shop from petty thieves. Looking at his plight, Sadagopan, a local Corporator, arranged for his marriage with Mary, a Christian. Thanks to her association with an NGO connected with the local Church, Mary had working knowledge of written and spoken English. This helped in his business. Alwar was in his mid forties and Mary was several years younger. Ammu is proud that her father has got recognition from several voluntary agencies for his service to society by way of providing ‘quality secondhand books’ and being a ‘Treasure house of secondhand books’. Among them is the ‘Thanthai Periyar Award’ that was conferred on Alwar a few years ago. Will Alwar’s book shop, made popular only by word of mouth and which has survived so many disasters in six decades, survive the latest attack by technology? Only time can tell! I purchased many books from his shop. He had very rare collection of books. Hope, his service will be carried by his family members. May God bless him and his family with abundance of good fortunes.